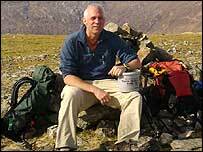 A British software expert has died during an ascent of Mount Everest, the Foreign Office has confirmed. Dr Rob Milne, 49, from West Lothian, was 1,200ft short of the summit of the world's highest mountain. 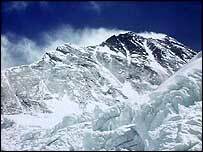 Only Everest stood in the way of the climber's goal to reach the highest peaks on each of the seven continents. The artificial intelligence specialist was, among other experiments, testing communications equipment during the climb of Everest. Officials in Kathmandu said they have been trying to establish how he died and are awaiting more details. Dr Milne's party had been hampered by bad weather during their ascent. He left home on 3 April for the expedition and arrived at base camp on Everest on 12 April. Dr Milne and his team spent several weeks acclimatising before attempting their ascent and were ready to go by 7 May. However, weather conditions were constantly against them, with high winds making it dangerous to proceed from Camp 3, 7,200m above sea level. On 20 May, the group had returned to base camp at 4,000m with the prospect of another week's wait. By 23 May, US-born Dr Milne, who was married with two children, wrote in his weblog that there was a "strong feeling of despair" as the weather refused to break. He said: "The weather is not co-operating, the jet stream is over Everest and the Monsoon too far south. "So there is no summit weather window for the south before 29/30 May. "There are a lot of frustrated people here and several other expeditions have now run out of time and are going home." However, he said veterans expressed confidence that conditions would change by the end of the month. By 27 May, Dr Milne's last weblog entry, there was a glimmer of hope. He said: "The long range forecast says we have a good chance the first few days of June, so we are holding out. Around June they have to close the icefall as it gets too warm, so it is down to the wire and getting late. "Crossing fingers didn't work before, so please think of something else!" "Otherwise in good spirits and health. Back to my book..."
Dr Milne was pioneering a system called IM-PACs, which allows climbers and adventurers to plan their expeditions more effectively and report progress to those monitoring. It was developed at the Artificial Intelligence Applications Institute in the School of Informatics at Edinburgh University. Dr Milne had announced his intention to "road test" the system on Everest, with a team at base camp monitoring his movements using a laptop and satellite telephone. Progress information was sent back via the internet to Edinburgh, alongside informal e-mail reporting. He had already climbed the highest peaks on six of the world's continents, with only Everest on the continent of Asia remaining. Mike Fourman, Head of the School of Informatics at Edinburgh University, said: "Rob was a pioneer of artificial intelligence applications, creating a successful company based in Livingston. "He has been a leader of scientific organisations concerned in his field across the UK, Europe and internationally. "He will be sorely missed by colleagues in industry and academia alike. Our thoughts are with his family at this time." At least two other climbers have died this season during periods of sustained bad weather on Everest. This weekend, veteran adventurer Sir Ranulph Fiennes abandoned his attempt to reach the summit due to a combination of health concerns and deteriorating conditions on the peak.